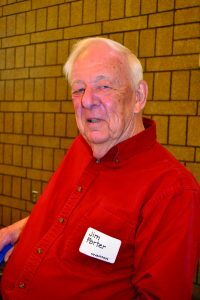 Jim Porter has been volunteering with W. Clarke Swanson Branch and W. Dale Clark Main Library for about five years. He said he needed something to do after his wife passed away, and when he asked if they needed help, staff at Swanson Branch happily accepted his offer. Porter likes being around books so much that he imagined he’d read them all in alphabetical order.